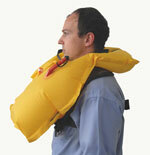 ROARING FORTIES™ SMA150-65 series is a general purpose inflatable life preserver vest exceeding Australian Standards for PFD Type 1s. The bladder design, which is modular, is similar to our model SMA1291, currently used by the Australian Commandos, Para Troopers, and Special Air Service (S.A.S.). The same bladder design had also been tested by Civil Aviation Safety Authority for our model SMA7801 and tested to Australian Standards AS1512:1996 for our SMA1060 series. The bladder is made of high quality polyurethane (PU) fabric, complies with the ISO 12402 requirements. The compact, light weight and non cumbersome construction is design to enable freedom of movement and action. With a buoyancy in excess of 150 Newtons, it has a freeboard of 110mm. The unique design of the bladder will allow the wearer to float in an inclined abgle of 45-60°. The bladder has been constructed to withstand an overpressure test upto 15 psi. The SMA150-65 series also comes complete with lifting beckett, whistle, and harness type fastening system. can only be inflated through the oral inflation tube. ROARING FORTIES™ SMA150-65 series with MOLLE attachment is a General Purpose Inflatable Life Preserver, designed specially for Military use. 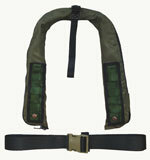 The MOLLE (loop and strap) attachment can be fitted to most Vest or Body Armour with MOLLE capabilities. 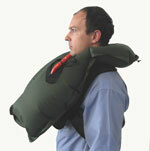 The modular design also allows any soldier to don the life preserver without a MOLLE Vest or Body Armour system. 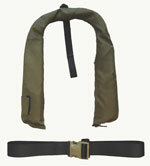 The webbing/harness is detachable/attachable to the life preserver with the least effort.